Republicans Hold the Senate: All the Key ResultsRepublicans increased their Senate majority by three net seats, with one race – which is leaning towards them – unresolved. Primaries Set Up Big General-Election BattlesFrom a wave of Democratic woman in Virginia to a shot at a GOP Senate seat in Nevada, the June 12 primaries set tables for a November banquet. Pompeo Confirmed As Secretary of State, With Seven Democratic VotesOnce Trump and Pompeo brought Rand Paul around, the hawkish CIA director’s confirmation was inevitable. The Democratic Party Is Moving Left – Except When You’re Not LookingSenate Democrats’ support for an indefensible bank bill shows that when public interest is low, Wall Street can still run Team Blue’s show. Will All the Harassment Claims Against Senators Be Released?Senator Tim Kaine thinks they should be. Democrats Must Soon Decide Whether Single-Payer Is a Litmus TestShould Democrats abandon incremental approaches to health care? Democrats Make a Risky Pick for Response to Trump’s Big Speech to CongressFormer Kentucky governor Steve Beshear is an out-of-work centrist representing a party that’s energized on the left. Tim Kaine’s Favorite Songs Are Just As Dad Rockin’ As You ExpectedYou have some competition, Joe Biden. Trump Ad Targets Crucial Hillary Clinton–Loving, Tim Kaine–Hating ConstituencyFinally, a message for people who love Hillary but fear she might die. The Kaine-Pence Veep Debate Was One of the Lowest-Rated EverOnly Cheney-Lieberman in 2004 and Kemp-Gore in 2000 fared worse. 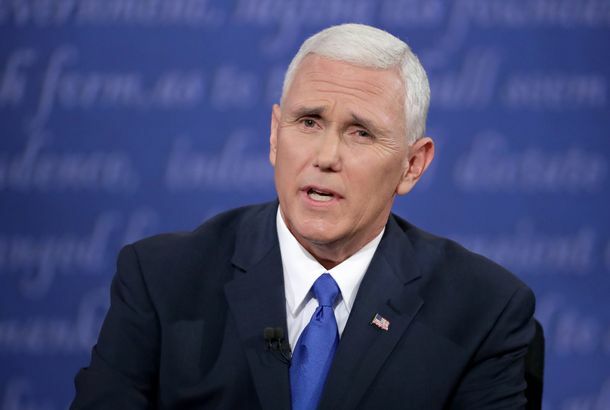 Mike Pence Lost the Debate Because He Lied About the Wrong StuffNever lie about statements that are on video. 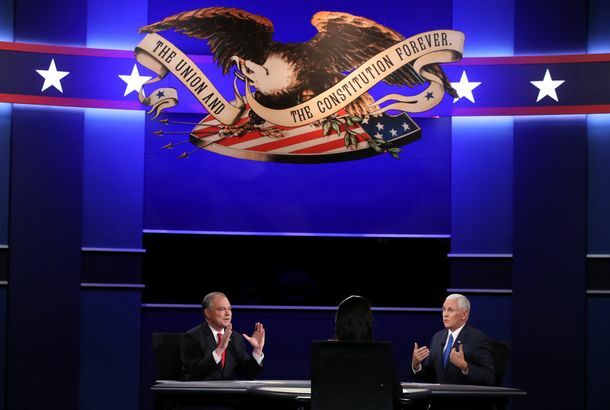 Guess How Many Times the Moderator Was Interrupted During the VP DebateSpoiler: a lot of times. Mike Pence Would Have Done Great at the Debate If Donald Trump Didn’t ExistAn evening of escapist fantasy for conservative intellectuals who like to imagine their party has nominated a qualified, normal person for president. After Prior Failure, GOP Tries Attacking Tim Kaine on Death Penalty AgainIt backfired when his gubernatorial opponent trotted it out a decade ago. Tim Kaine Declines to Sign Senate Resolution Calling for Public OptionThe public option may be Obamacare’s best hope for long-term success. And moderate Senate Democrats are lining up against it. Let Hillary Clinton and Tim Kaine Convince You They’re BFFsOtherwise known as their People interview. Tim Kaine’s Wife Won’t Run for Senate Because She Doesn’t Want Him As a BossShe’s all for public service, but there are limits. Tim Kaine Plays Harmonica on The Late ShowWe can’t wait for him to start touring. Did Elena Ferrante Write Hillary Clinton’s New Book?My Brilliant POTUS. Kaine Affirms His Support for the Hyde AmendmentEarlier this week, Hillary Clinton’s campaign manager told CNN that Kaine would support her push to repeal the ban on federal funding of abortion. On Friday, Kaine said that he will not. Was Tim Kaine Wearing Mascara Last Night? An Investigation.Don’t hate him cuz he’s beautiful. Did Tim Kaine Remind You of Anyone Last Night?Hillary Clinton’s VP pick is the dad America needs. Tim Kaine Burnishes His Attack-Dog Cred With a Trump ImpersonationOut of nowhere, Tim Kaine tore into Donald Trump with mockery and savage denunciation. Tim Kaine’s Being Logical About Abortion, If Not Totally ConsistentRepublicans are crowing over Tim Kaine’s “flip-flop” on the Hyde Amendment banning the use of Medicaid funds for abortion services. But if you’re going to support legal abortion, why draw the line at letting poor women have them? Tim Kaine Doesn’t Mind Being Third Wheel to Two President ClintonsKaine didn’t look like Clinton’s hostage on 60 Minutes, so compared to the Trump-Pence interview, it was wildly successful. Hillary Clinton and Tim Kaine Had a Great Time at the Official Veep AnnouncementA rally in Miami was joyful, optimistic, and showcased exactly why Clinton picked Kaine. The Case for Tim KaineThe myopia of liberal disappointment. The Clinton-Kaine Ticket Is Safe and Boring — In a Good WayKaine is getting grief from the left, and objectively, some of it is undeserved. Or all of it is, if you look at the alternative. Hillary Clinton Picks Virginia Senator Tim Kaine As Her Running MateYes we Kaine. Clinton VP Favorite Just Gave the Left Two More Reasons to Distrust HimOn Monday, Virginia senator Tim Kaine signed on to two letters calling on the federal government to scale back regulations on community and regional banks. Tim Kaine and the Evolution of Pro-Choice PoliticsA candidate who morally condemns abortion even while pledging to protect it as a right is a problem for some Democrats. Democrat Tim Kaine Makes Puzzling Tax RemarkWhat? What’s going on? Now the Dems Want Weiner Out, TooAnd they’re talking about it. New Yorkers Stand by Their WeinerA majority of New Yorkers don’t want Anthony Weiner to resign. The Wait Is Over: Tim Kaine Is Running for SenateFlorida Congresswoman Debbie Wasserman Schultz will replace him at the DNC. Senator Jim Webb Is RetiringAfter only one term, he’s returning to the private sector. The Midterm Snapshot: October 14A look at what’s happening in races around the country. Richard Blumenthal Is SorryThe Democratic candidate for senator in Connecticut apologizes. Tim Kaine to Be Next DNC ChairThe Virginia governor will helm the party into the Age of Obama. Is Obama Planning a Veepstakes Shocker This Week?After endless rumination and media speculation, Barack Obama’s decision on a running mate is nigh. Nigh! Just how nigh, nobody is quite sure. Lukewarm Reactions to Favored Obama Veep CandidateVeepstakes speculation is hot again, and the name on everybody’s lips is Virginia governor Tim Kaine.